Orlando City Head Coach Jason Kreis. USA Today Sports. New York City Football Club lost a tough one on Sunday at Yankee Stadium, 2-1, to Orlando City SC and their old coach, Jason Kreis. Kreis was the coach for NYCFC's inaugural season in 2015, and was dismissed after that season. He took over Orlando City last August, and beat NYCFC twice at home before this win in his return to Yankee Stadium. 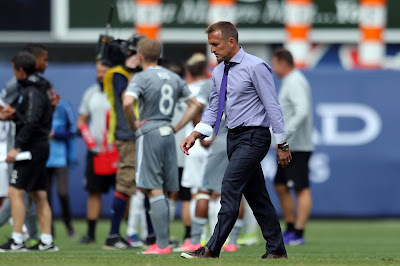 On what it meant to him to get this victory, Kreis said, "As I've been saying for a while, I think each game that we play against New York City, the emotions for me are less and less. The attachment is less and less, and to the point where really this week I didn't have any extra motivation. I mean, it was just about getting our team to have a solid road performance, it's only our second road game, and to show that we are a team that can win away because a lot of the hype and the word around town is that we only had four wins because they were at home and nobody can say that anymore." Orlando City was led by Cyle Larin, who scored two goals, in the 31st and 51st minutes. Larin now has nine goals in seven matches against NYCFC. Kreis said of why Larin has success here, "I remember him having success a few years back, and didn't like it when I was on the receiving end, so really happy. I don't know what it is necessarily, maybe it has to do with the size the field, a little easier for him to get in front of the goal. Not sure, but hats off to him, monster performance. It wasn't just the goals by the way, really solid effort for us defensively as well." NYCFC Head Coach Patrick Vieira said of whether he is disappointed with how the team defended Larin, "I think you have to give him a lot of credit because he was at the right place at the right time, and the way he finished was really good. I'm not surprised at all because we knew if he had the chance and he was in the box he would finish. More than the goal, I think is the situations we give them to finish those chances. I think when you look at the first goal, we weren't there to defend and that's important for us to win. We conceded two goals because we defended badly." NYCFC Defender Maxime Chanot said of what makes Larin and Orlando City SC so difficult, "Nothing much. Congratulations to [Larin] for scoring two goals but I don’t know how many times he shot on goal, maybe three or four times, I don’t know. But he’s a very good striker, so I have to congratulate him. With the two goals he did his job and it’s good for Orlando but unfortunate for New York City." David Villa got NYCFC's lone goal in the 74th minute, off a nice volley on a free kick from Maxi Moralez. Moralez and Jack Harrison both came close with great chances in the final 10 minutes but Orlando City goalkeeper Joe Bendik prevailed with three excellent saves and the visitors held on for all of the points. NYCFC fell to 3-3-1, seven points on the season, and they had their 11-match regular season home unbeaten streak snapped today. Heading into today, NYCFC had gone 9-0-2 in their last 11 regular season matches, outscoring opponents 31-11. Eight yellow cards were issued by referee Sorin Stoica in today's match, tied for the most issued in an NYCFC match. The last time this happened was back on July 24, 2016 when NYCFC squared off against the New York Red Bulls. The last time this happened at home was coincidentally the last time Orlando City SC visited Yankee Stadium back on May 29, 2016. NYCFC Midfielder Thomas McNamara made his first start of the season, and he said of that, “It was nice to be able to work my way into the Starting XI. There were moments that were good, there were moments that were not so good. It’s a little difficult having not played a full game in a while, but it’s part of it." McNamara said of what was the most difficult part about today facing Orlando City SC, "I thought we did pretty well for the most part, but there were a couple of key moments defensively, especially regarding myself, that we lost 1v1 and put the team in very difficult positions and if you’re allowing service into Cyle Larin, more likely than not he’s going to get goals."